The months of February and March saw unprecedented cold weather for the first time in the past few years. Normally, students experience wind and rustling leaves at the bottom of their boots. However, this trimester we were greeted with a winter wonderland and heavy snowfall which was a somewhat refreshing change from the usual routine. As pretty and enjoyable the snow was, it has been a menace to many over the past month by causing many inconveniences for students and staff. As the trimester progressed, we also witnessed heavy snow and rainfall, as well as loud thunder and lightning. One of the victims of this extreme weather has been the Information and Communications Technology (ICT) department. “The thunder and lightning have caused us a lot of trouble,” said Mr. Shailender Bhandari, Network Manager. It interfered with the “switches and access points” which caused a loss of 400 to 500 thousand rupees and a large loss of equipment. The power supply was another issue since it was “not very good” and caused the ICT to regularly lose network and power in different places. The weather prevented them from getting network backup as well. The snow caused further inconvenience as it interfered with transportation. It also stopped ICT members from going to residences and fixing any damages that were done to any devices or equipment in dorms or residences. “Not to mention when you slip, and fall, and die because how slippery and icy it gets after the snowfall,” Loomba added. Other than the pretty views, Noori found the weather refreshing and was “very happy” because of how excited everyone was to play outside with the snow. Ms. Priya Rollins, Midlands dorm parent, said that the snow has made her everyday life “definitely more exciting.” She too had mostly positive things to say about the snow. 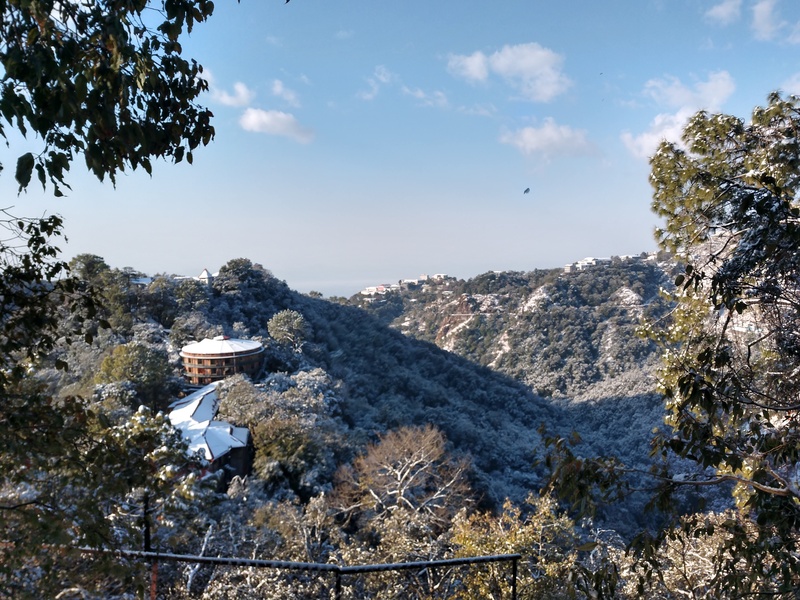 “Especially as parents of a young baby we’ve [Ms. Priya and her husband Mr. Aditya Manral] had to layer up [thier son] Bodi, to the point that he cannot move, which has been new,” Ms. Priya said regarding the snow. Ms. Priya described her and Mr. Manral’s experience with the weather as positive. She liked the feeling of going out in the mornings and wanting to get warm over the first few weeks of this very cold trimester. What did cause a bit of an issue in their lives were the thunderstorms, which Ms. Priya describes as “intense.” On one of the nights of the thunderstorms, their kitchen got struck by lightning. “The tree next to our house is taller than Midlands,” said Ms. Priya, “that’s probably what conducted the electricity.” When the lightning hit their home, the family was in bed and they heard a loud sound as if “something giant hit the house.” This caused a three-inch hole on their kitchen wall. Although no serious damage was done, the lightning blew up a plug point and fried up some onions in their kitchen. “It was so hard to get up in the mornings,” said Gyamtsho, “it was supposed to be so much warmer. We had to put on puffy jackets and always carry umbrellas to school,” which she found particularly inconvenient as it made everybody’s daily task of walking up to school more difficult burdensome than it already was. Luckily, with warming temperatures, and rapidly decreasing layers in recent weeks, the school environment has finally improved – just in time for the preliminary exams this week.